Mylan NV’s aggressive pricing of its EpiPen emergency injector has brought Congressional investigations, widespread denunciation from consumer and health advocates, and numerous legal challenges. What could be worse? Competition. And that's what drugmaker Kaleo Inc. says it will provide early next year when its Auvi-Q injector returns to the marketplace. 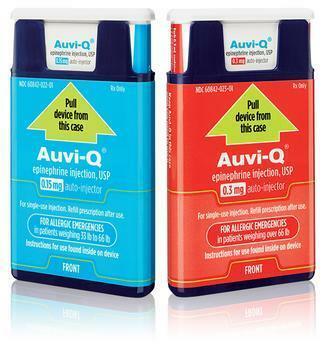 The Auvi-Q was recalled last year because of potential malfunctions that could deliver the wrong dose of epinephrine, used to counteract the life-threatening anaphylactic shock that allergy sufferers sometimes encounter. “As the inventors of Auvi-Q, my brother and I have dedicated our lives to researching and developing an innovative epinephrine auto-injector that would do for severe allergy sufferers what the AEDs did for cardiac arrest in the community; namely a product that could assist and guide even an untrained user through a life-threatening emergency,” said Evan Edwards, vice president of Kaleo. Kaléo said it is working to "ensure that all patients regardless of insurance coverage, have affordable access to Auvi-Q." The EpiPen contains about $1 worth of epinephrine, but it costs $600 or more for a package of two in the United States, a huge increase over the $57 the EpiPen went for in 2007. Epinephrine loses potency over time and the device must be replaced annually. The problem, of course, is that $600 is a lot of money for most people. While some insurance plans cover some of the cost, depending on the deductible and other factors, consumers can still wind up paying hundreds of dollars for an EpiPen two-pack. Auvi-Q was originally marketed by French pharmaceutical giant Sanofi in 2013 but was pulled from the market in October 2015 because of suspected malfunctions that did not result in any known deaths. Sanofi later ended its partnership with Kaleo, which is now relaunching the product. Kaleo said that after regaining the rights to Auvi-Q, it "conducted a thorough manufacturing assessment and invested in new technology and quality systems to ensure accurate, reliable and consistent delivery from the product." The Auvi-Q is similar to the EpiPen, in that both are compact epinephrine auto-injectors. Kaleo says its device has a number of industry-first features, including a voice prompt system that guides a user with step-by-step instructions through the delivery process, and a needle that automatically retracts following administration. "AUVI-Q is engineered to help patients and their caregivers to confidently administer epinephrine in life-threatening allergic emergencies," the company said. Kaleo's announcement was well received by allergy organizations which have previously expressed frustration over the EpiPen situation. “We are very excited about patients once again having a choice in epinephrine auto-injectors,” said Eleanor Garrow-Holding, President and CEO of the Food Allergy & Anaphylaxis Connection Team (FAACT). “Those living with life-threatening allergies deserve innovative products and choices that meet their individual needs." Kaleo is a closely held company based in Richmond, Va.